Way up in the northwestern section of France is a peninsula that is windswept with a craggy coastline filled high with stone rocks and cliffs. It has its own culture and language much different than French and the people are hearty and work the land. There are golden beaches along dramatic coastlines as well as mysterious and ancient burial grounds along with medieval chateaus. Here the land and people are steeped in the myths and legends of King Arthur and Merlin. 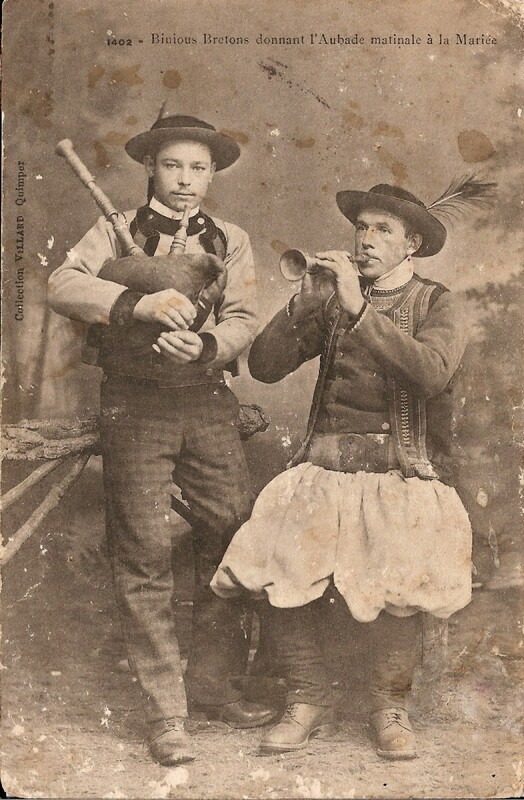 Also here, the Celtic culture is alive and well with its strong tradition of unique music, dance and traditional costumes from centuries gone past. The Bretons of Brittany, France or Breizh, as they call their native land, are the last vestiges of the Celtic Britons that migrated from Great Britain and gave their name to this northwest section of France. 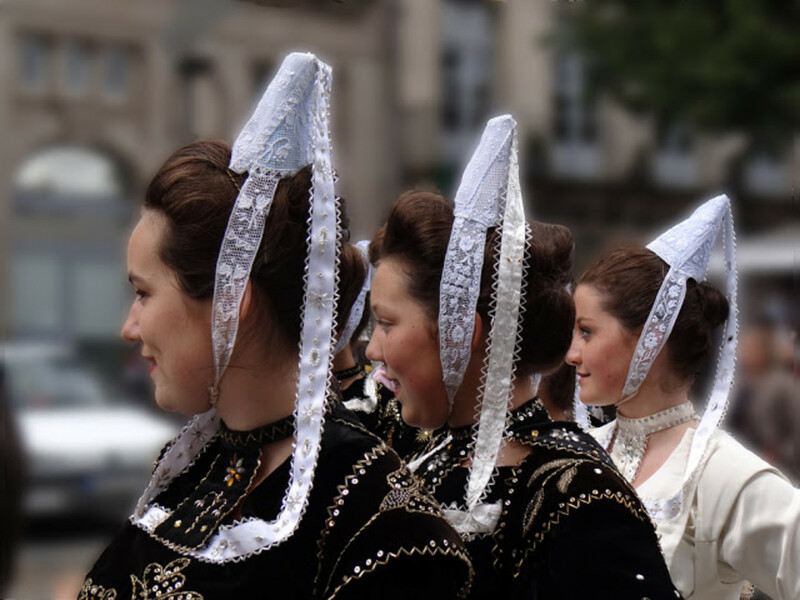 They speak both their traditional language, Breton or Brezhoneg and also French, the first language of France. 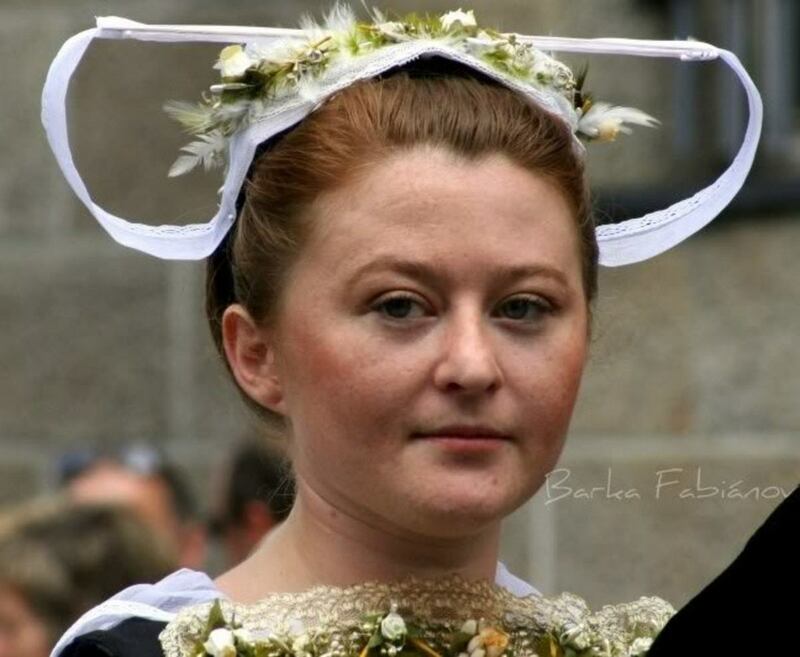 These hearty people have preserved their distinct and different culture and language in France since the fifth century and continue to do so today although the Breton language is becoming an endangered language. 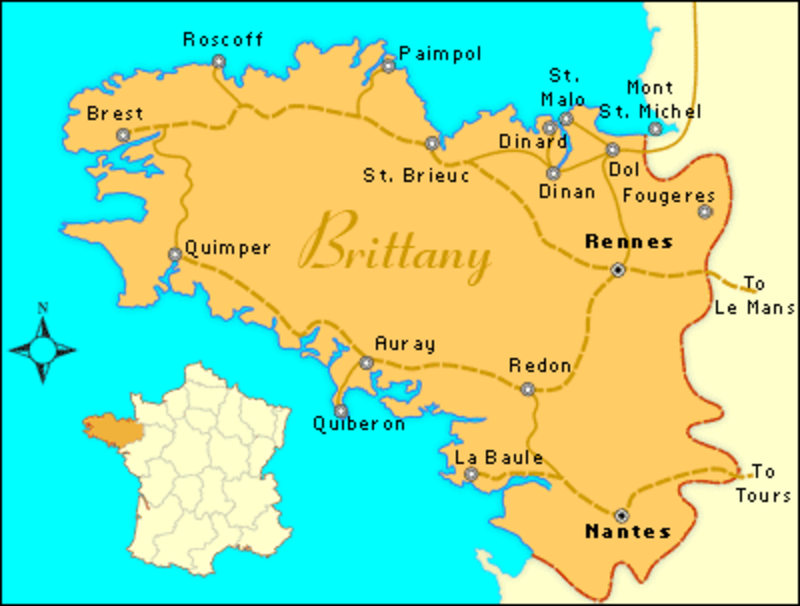 Today, Brittany has a population of approximately four million people. The Breton language is the only Celtic language still spoken on the European continent today with approximately 365,000 speaking Breton of whom 240,000 speaking it fluently. Most speakers are over sixty-five years of age and this is why the language is becoming an endangered one. Efforts are being made today to keep Breton a living language by teaching it in the French schools, although France does not recognize it as a regional language. 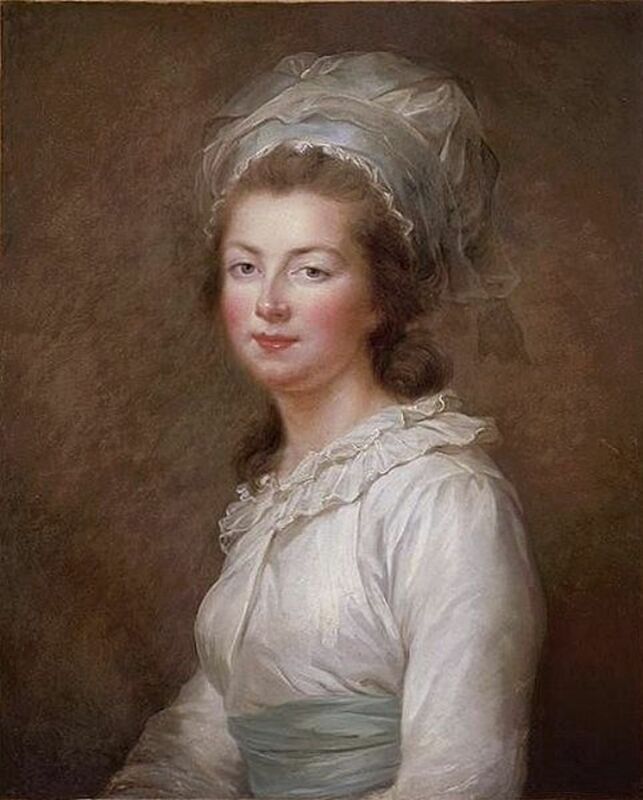 French is the first and only official language of France today. Therefore, most Bretons today speak both French and Breton. 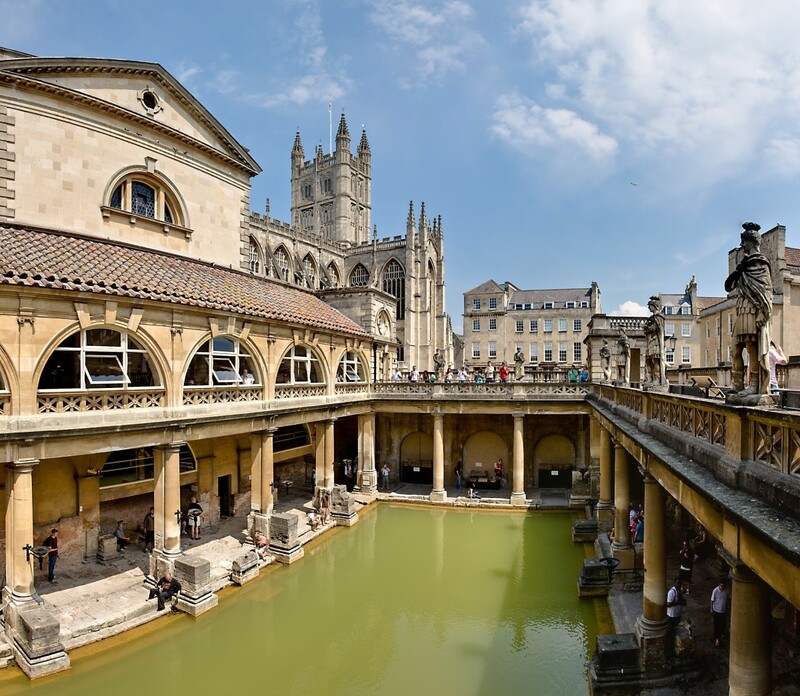 This interesting ethnic group traces their heritage to the groups of Brittonic speakers who emigrated from southwestern Britain, including Cornwall, England to avoid the Germanic tribes that were entering Great Britain. These Britons migrated in two large waves from the third through the ninth century, and most heavily from 450-600 AD, to the Armorican peninsula (as named by the Romans) which was subsequently named Brittany after them. 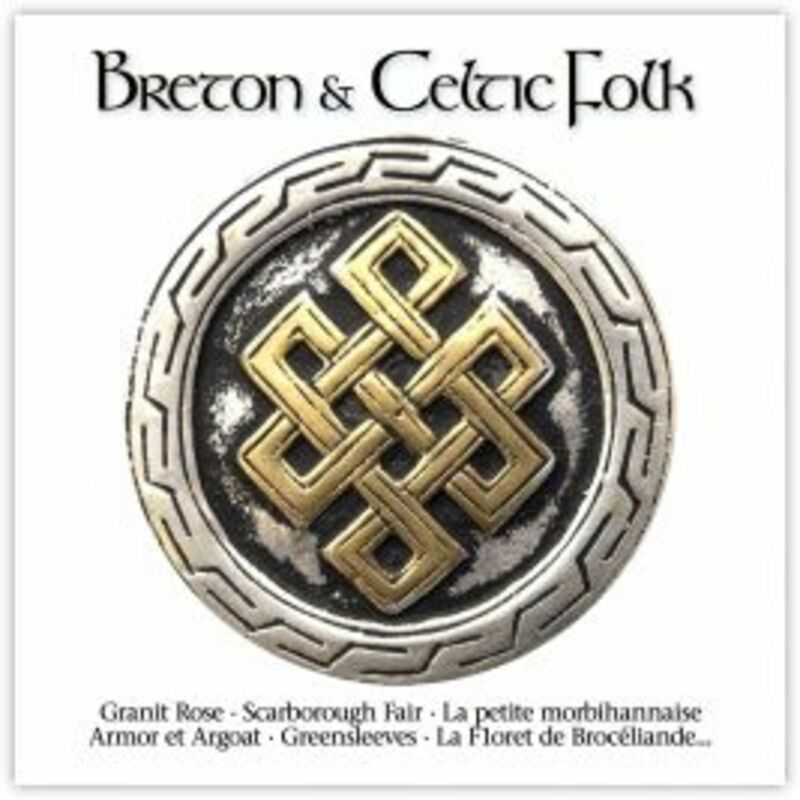 Breton is part of the Insular Celtic languages from the British Isles, specifically the Brythonic branch or the P-Celtic languages. It is believed by historians that a large number of Britons in the Roman army may have been stationed on this peninsula around 380 AD. During the ninth century, the Historica Brittonum, written by Geoffrey Monmouth, states that Roman Emperor Magnus Maximus settled troops there after they withdrew from Britain. These Britons gave this region its current name, Brittany, and contributed to the Breton language, a sister language to Cornish and Welsh. The legends tell us that Conan Meriodoc was the mythic founder of the House of Rohan and is mentioned in several Welsh sources as having led the settlement of Brittany by mercenaries serving Maximus. 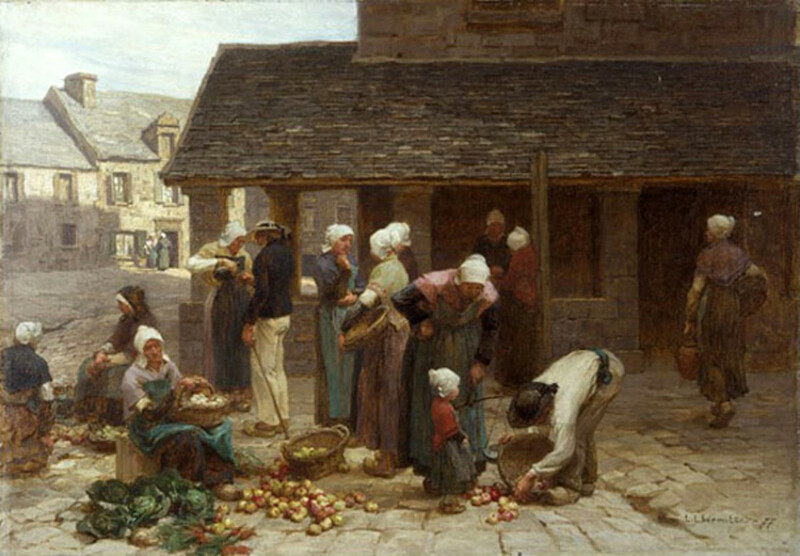 Modern French scholars, such as Leon Fleureot, suggest a two-wave model of migration from Britain which saw the emergence of an independent Breton people and established the dominance of the Brythonic Breton language in Brittany. During the Briton emigration to Brittany, several Christian missionaries and saints, mostly Welsh, came to the region and founded Christian Roman Catholic dioceses. 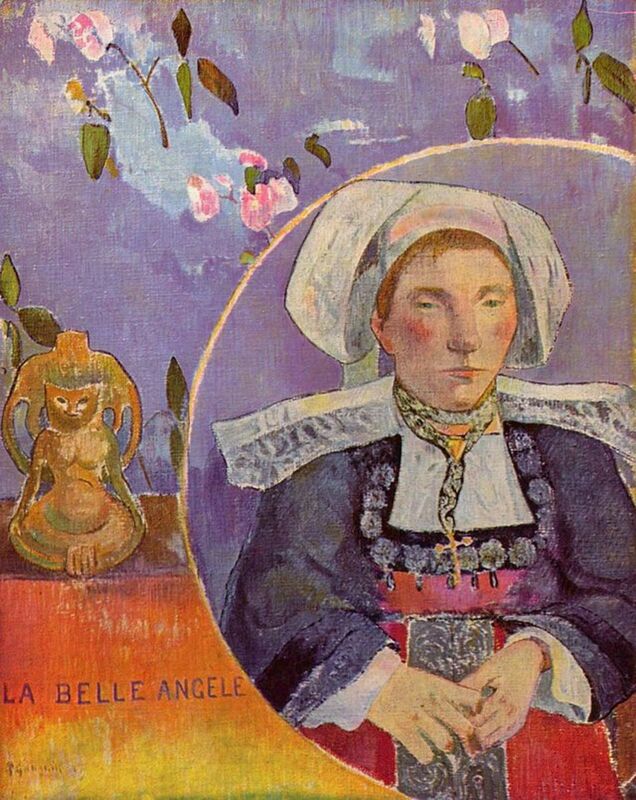 The patron saint of Brittany is St. Anne, the mother of the Virgin Mary. 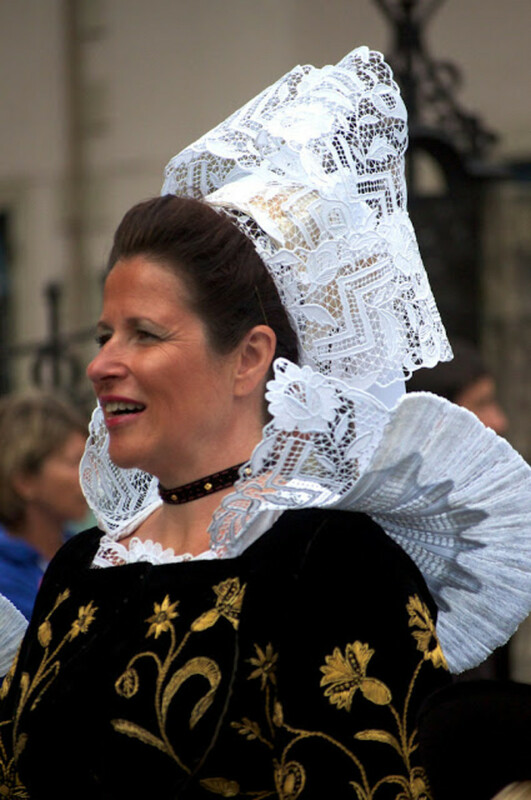 Brittany has always been the most devoutly of the Catholic regions in France. These three kingdoms eventually merged into a single state during the ninth century. King Nominoe (845-851 AD) unified Brittany and he is considered as the Breton pater patriae. Erispoe, Nominoe's son, secured the independence of the new kingdom of Brittany when he won the Battle of Jenland against Charles, the Bald, son of Charlemagne. 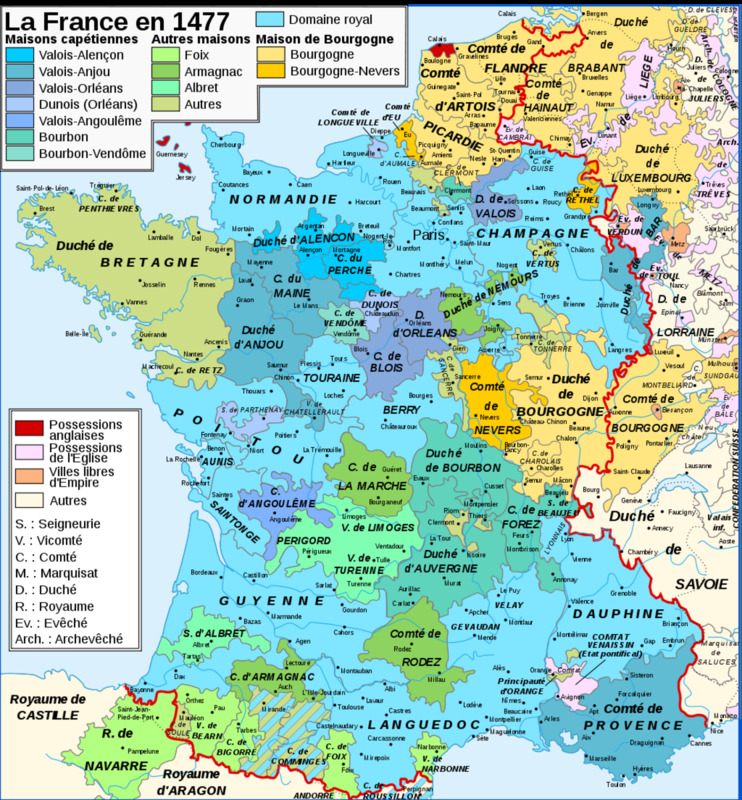 The Bretons resisited incorporation into the Frankish Carolingian Empire. During the 10th century, Brittany was attacked by Vikings. Alan II of Brittany expelled the Vikings from Brittany in 937 AD and recreated a strong Breton state. France in 1532 as a province. Most of the Celts living on continental Europe during the Halstatt and La Tene era were Gauls and spoke Gaulish Celtic languages. Because Brittany was inhabited by Britons in the fifth and sixth centuries, they brought the Insular Celtic or Brythonic language to Brittany. The Brythonic Celtic languages are not closely related to Gaulish. It is believed by historians and linguists that the Gaulish inhabitants of the interior of Brittany adopted the Brittonic language. The demarcation line of the Breton language is west of a line of the cities of Alet, Corseul and Vannes. Breton is most closely related to Cornish and distantly related to Welsh as both are southwestern Brittonic languages where the Breton people emigrated from. Breton derives from the P-Celtic languages of southwestern Britain as opposed to the Q-Celtic languages of Ireland and Scotland. Breton is most distant from the Irish and Gaelic Scottish languages. 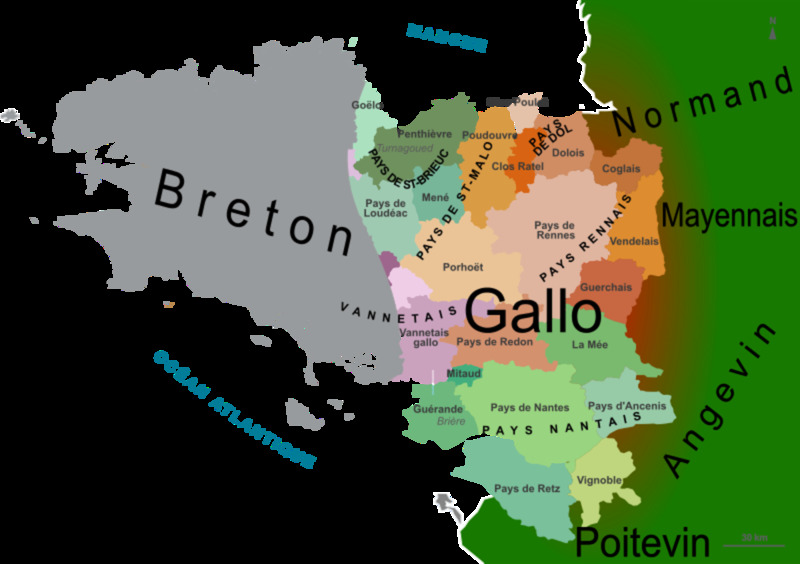 Another regional language of Brittany is Gallo, a Romance language descended from Latin. It is unlike Gaulish also. Gallo is closer to French although not mutually intelligible. However, Gallo does share certain points of vocabulary, idiom and pronunciation with Breton. Old Briton - before 1000 AD. The oldest surviving manuscript in the Breton language comes from this period. It is a botanical manuscript kept in Leyden, the Netherlands and it predates by more than a century the oldest text referenced in French. Middle Breton - 1000AD to the 17th century. Catholican of Jehan Lagadeuc, the first to write a multi-lingual dictionary in 1477. It lists and defines words in Breton, French, and Latin. Old Breton, therefore, has been attested to from the late ninth century. It was the language of the upper classes until about the 12th century, after which, it became the language of the commoners of western Brittany. 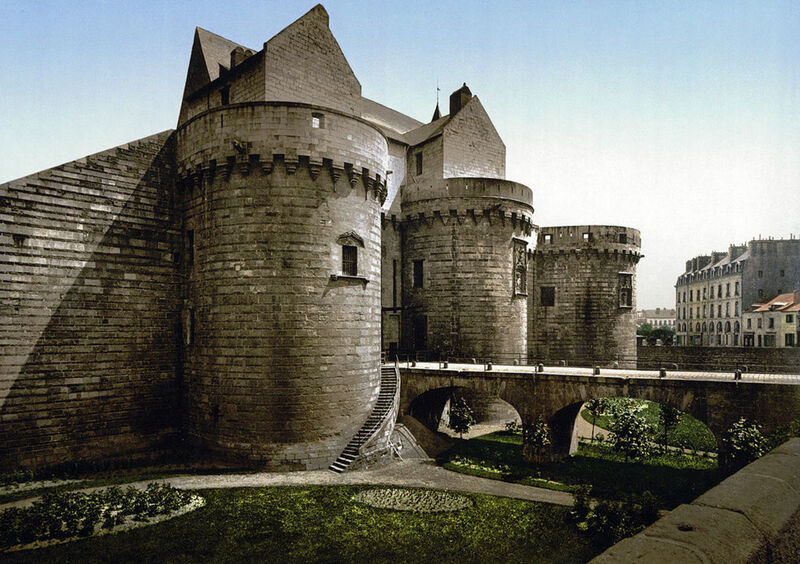 By the 12th century, the nobility followed by the bourgeoisie adopted the French language. 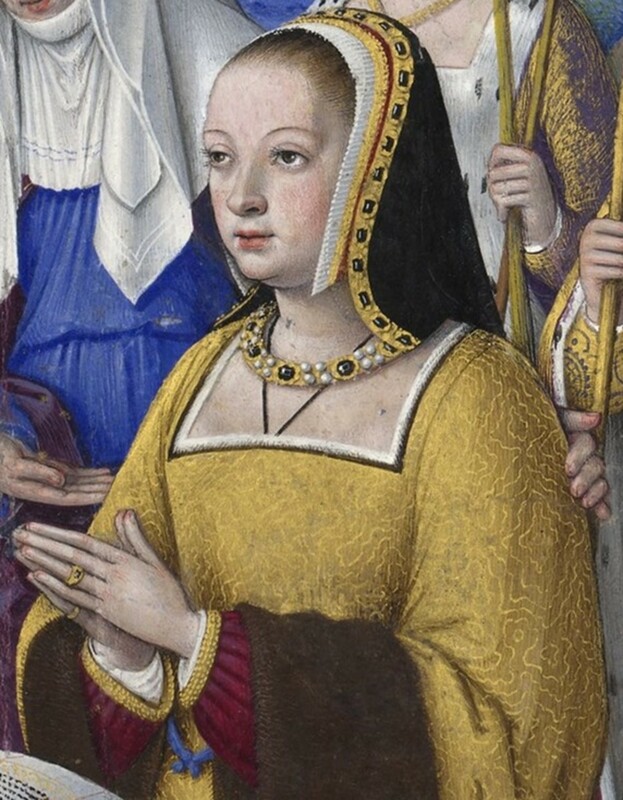 The written language of the Duchy of Brittany was Latin and switched to French around the 15th century. Old Breton extant words are glosses in Latin manuscripts from the ninth and tenth centuries that are now scattered in libraries and collections throughout Europe. Historians and researchers believe that Old Breton literature inspired much of Arthurian literature. The story of Tristan and Iseult and the romances of French historian and writer Cretien de Troy are believe to have come from the Bretons during the Old Breton language period. According to historians, Broceliands is located in Brittany and is considered today to be the Paimpont forest. Ruins of a castle around the lake are associated with the Lady of the Lake and a dolmen is said to be Merlin's tomb and a path is presented as Morgan le Fay's Val sans Retour. 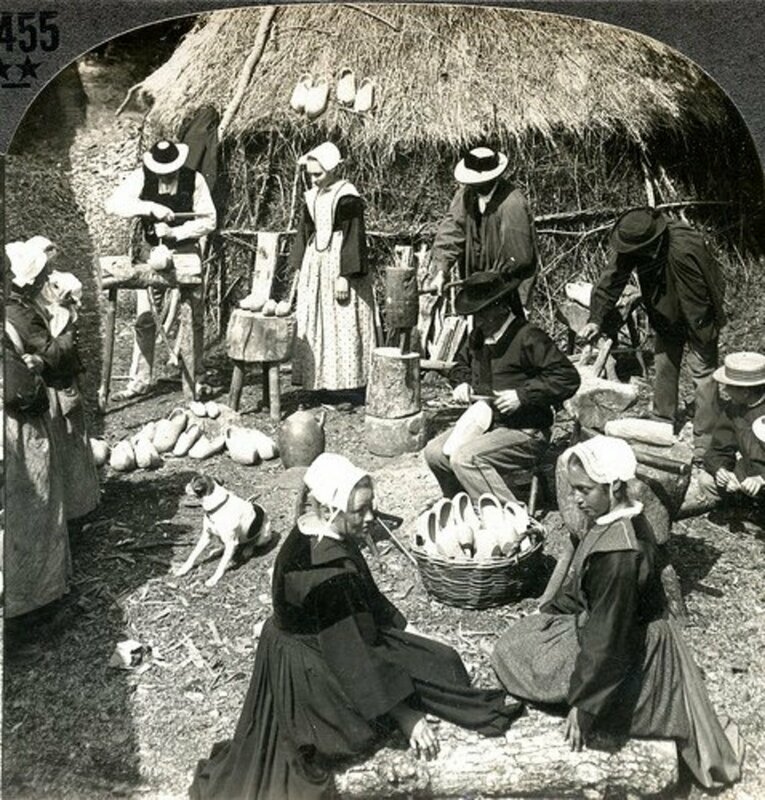 The Bretons had a highly verbal tradition during the Old Breton period and passed their history, culture and customs down word of mouth from generation to generation. The oldest surviving manuscript form the Old Breton period has even predated any of the French manuscripts that have survived over the centuries. This botanical manuscript is the most ancient text in a continental Brythonic language and was studied by the late professor Leon Fleuriot (1923-1987). The manuscript is a fragment of medicinal recipes composed of plants, suggesting that the Breton language may well have been used by people of learning at the turn of the 11th century. Another Breton manuscript on display at the British Library in London, is the Breton Gospel, which dates from about the ninth century. Although mostly written in Latin it is an important work in terms of the wider scope of Breton culture. This manuscript attests to the high degree of learning and monasterial wealth in Brittany comparable to that of the Lindisfarne Gospels (England) and the Book of Kells (Ireland). 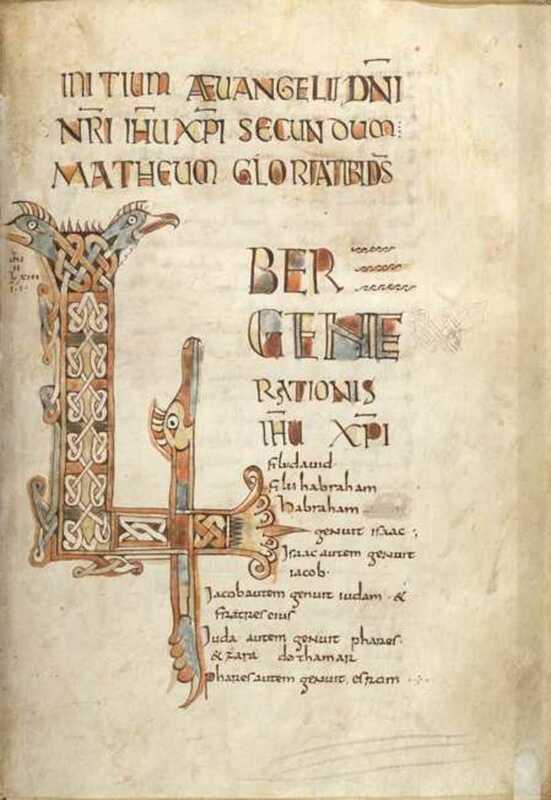 The Breton Gospel contains the Latin text of the Four Gospels from the New Testament of the Bible, along with prefatory material and canon tables. The Breton Gospel is written in the similar form of Carolingian minuscle (lower case letters) developed at Tours, France one of the classic centers of the Carolingian Revival or Renaissance. The large illuminated letters of the Breton Gospel are like those found in the Carolingian manuscripts; however, the decoration is far more similar to the insular manuscripts such as the Book of Kells and the Lindisfarne Gospels and suggests a continuum of this cultural tradition. The decoration in the Breton Gospel is simpler and more geometric than in the insular manuscripts. Before the 20th century, most of the Breton literature consists of religious writings. Jean-Francois Le Gondec (1775-1838) played an important role in Breton literature by initiating a reform of the Breton orthography. He produced an orderly Breton grammar and wrote the first Breton translation of the New Testament of the Bible. There are no clear boundaries between the dialects because they form a dialect continuum varying only slightly from one village to another. The French constitution states that the French government does not provide official recognition rights or funds to support the use of regional traditional languages, so French is taught in schools and is the official language of the country. Since the 19th century, Brittany and its people began a revival of the Breton literature that continues to flourish today. The Breton language over the years has borrowed quite a lot of French vocabulary and some of the Gaulish language vocabulary into Breton. From 1880 to the mid - 20th century, the Breton language was banned from the French school system and students were forbidden to speak it. France, today, does not recognize any local or regional languages. French is the only recognized language of France. By 1951, however, the forbidden language situation changed with the Deixonne Law. This law allowed Breton language and culture to be taught in French schools on a part-time basis. A modern standard orthography of Breton was devised in1908, but the dialect gwenedeg or Vannetais was not included. That was changed in 1941 with a reformed orthography that finally included Vannetais. But, because Breton is not recognized by the French government as an official or regional language, it is now endangered. 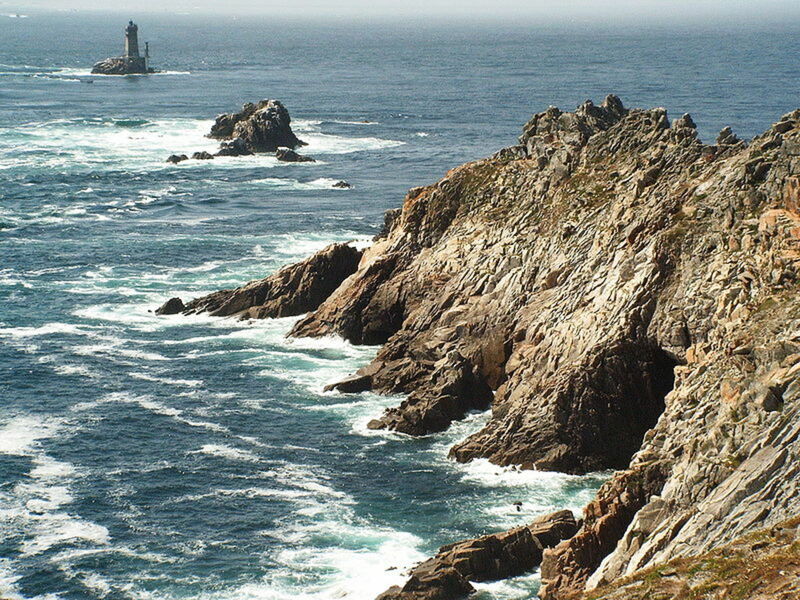 Breton, today, is mostly spoken in western Brittany. Eastern Brittany is where Gallo and French are spoken with a little Breton thrown in. 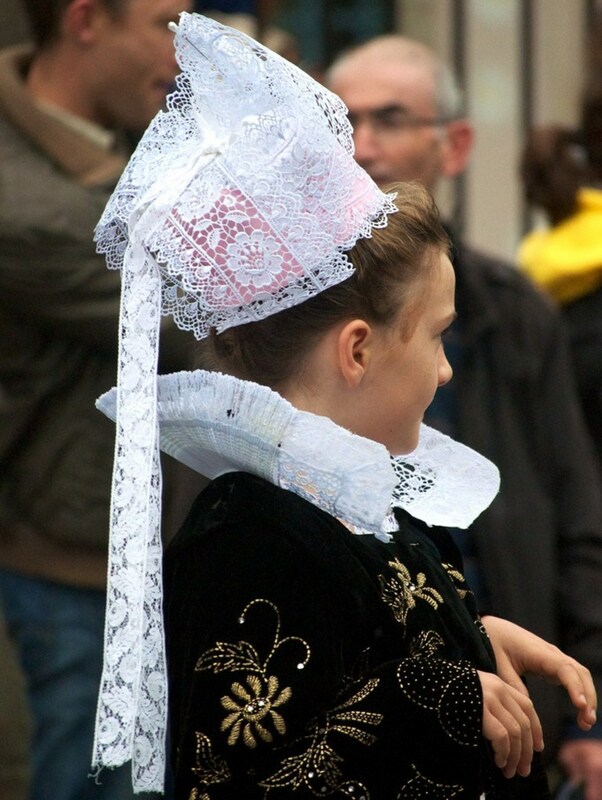 Since the 1990's, the Bretons are focusing on preserving their unique culture and language rather than on political separation from France, which they once considered doing. Since this time there is only a small number of people who speak Breton as a first language and they are mostly sixty-five years of age. Today, there are several newspapers and magazines written in the Breton language. There are also Breton radio and television stations that broadcast in the Breton. 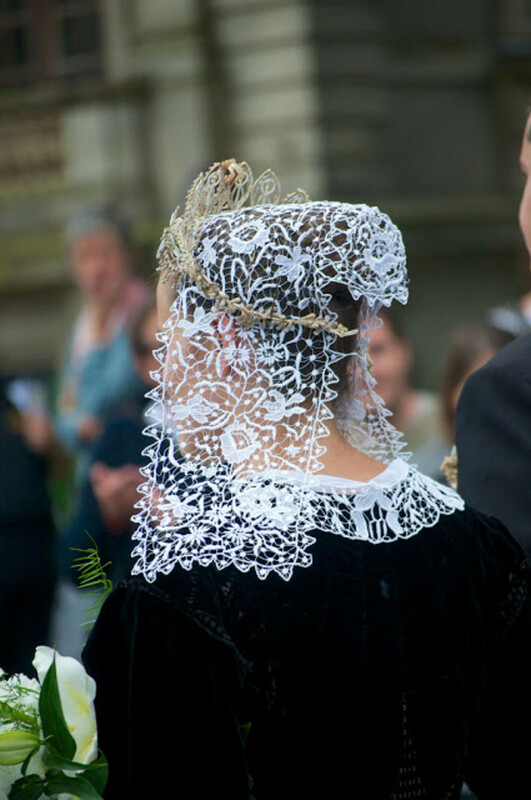 The Fest-noz, a Breton festival which began in the Middle Ages, was revived around the 1950's and is the traditional festival dance in Brittany. 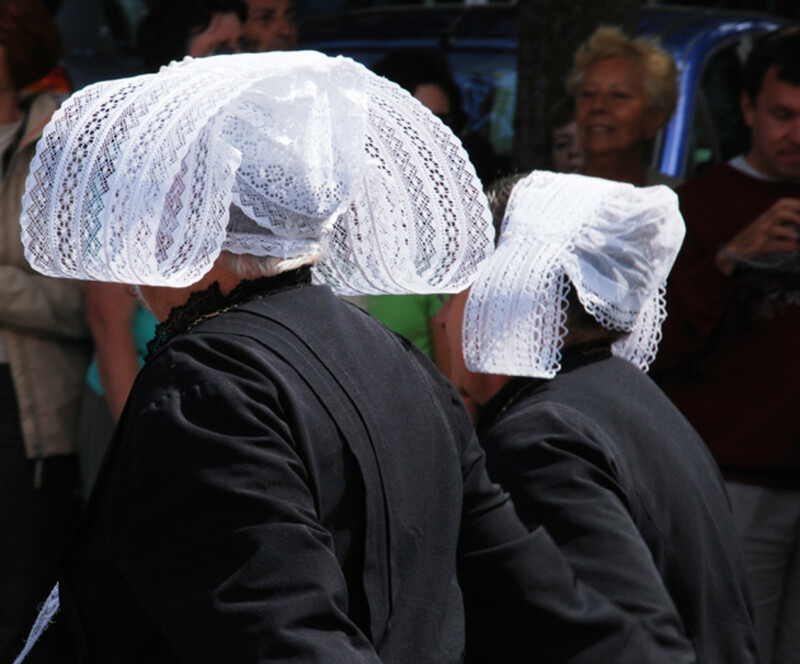 Other traditional Breton dances are gavottes, an dro, hanter dro and the pinn. During the Fest-noz most of these dances are done in a chain or circle while holding the finger of the persons next to them. There are also pairs dancing and choreographed dances. 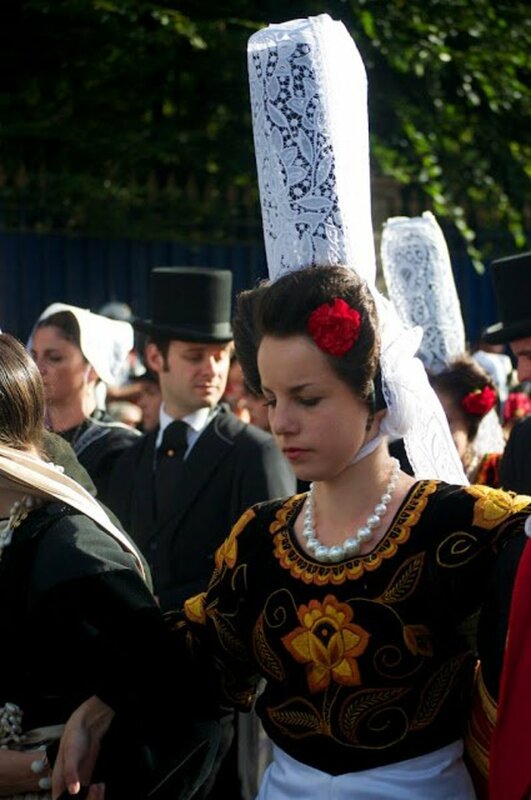 Of course, the traditional dress has continued and is worn during festivals and for tourism reasons. The men wear what I call the 'balloon pants' from the medieval and renaissance periods, with tights and wooden shoes. The women wear long dark dresses adorned with much embroidery and lace. 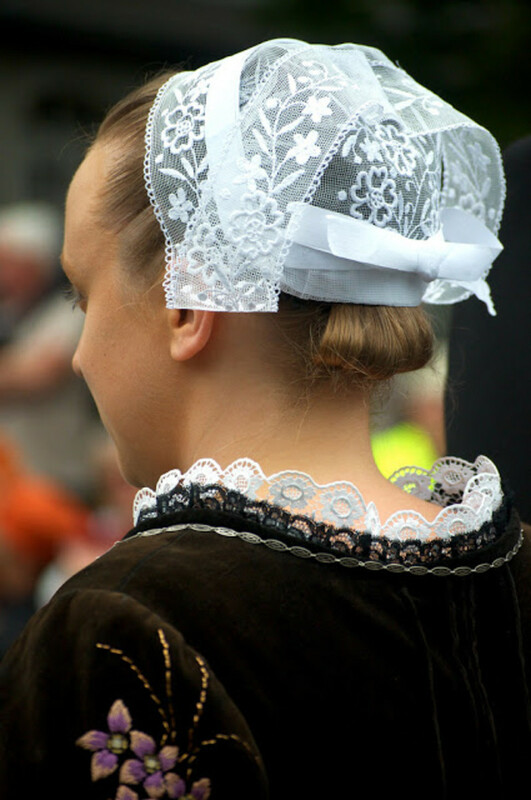 Their lace caps, called coiffes (pronounced kwaffs) are white lace with ribbons and each village or area has a different coiffe. 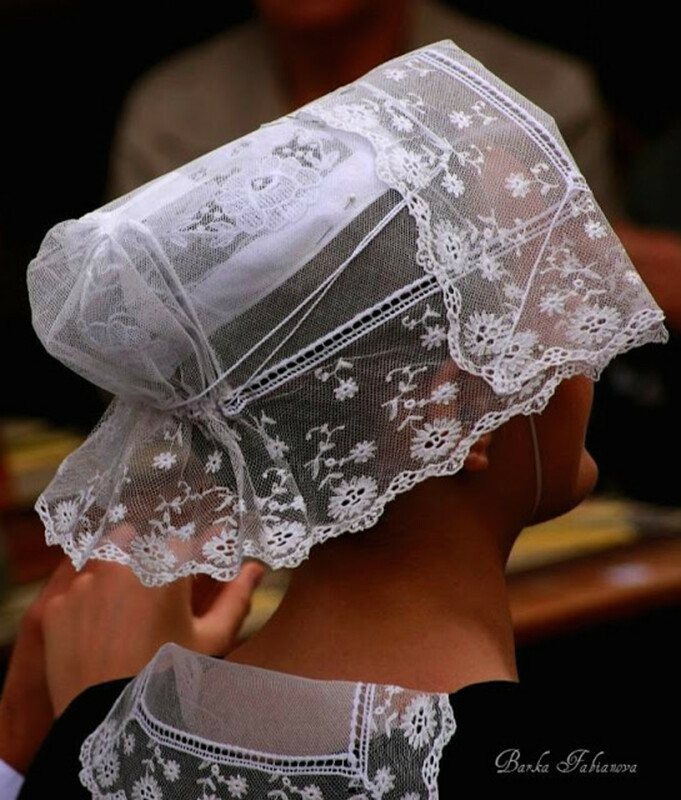 Different types coiffes tell where the woman is from and if she is single, married or widowed. 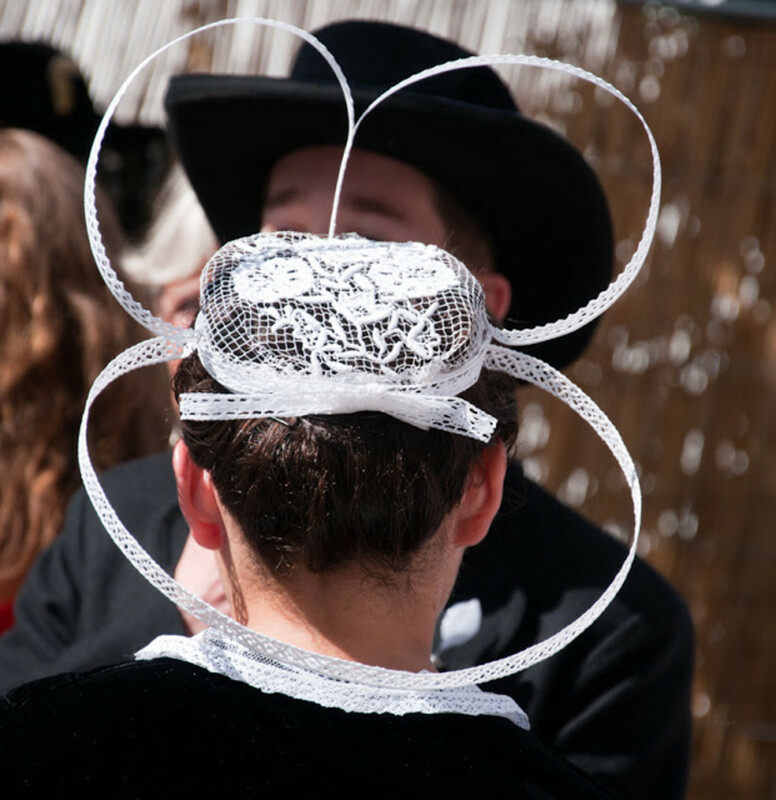 The most unusual of the coiffes is the 'coiffe of Bigouden.' It is a thirty to forty cm high cylinder of starched lace perched on top of the head like a tower. 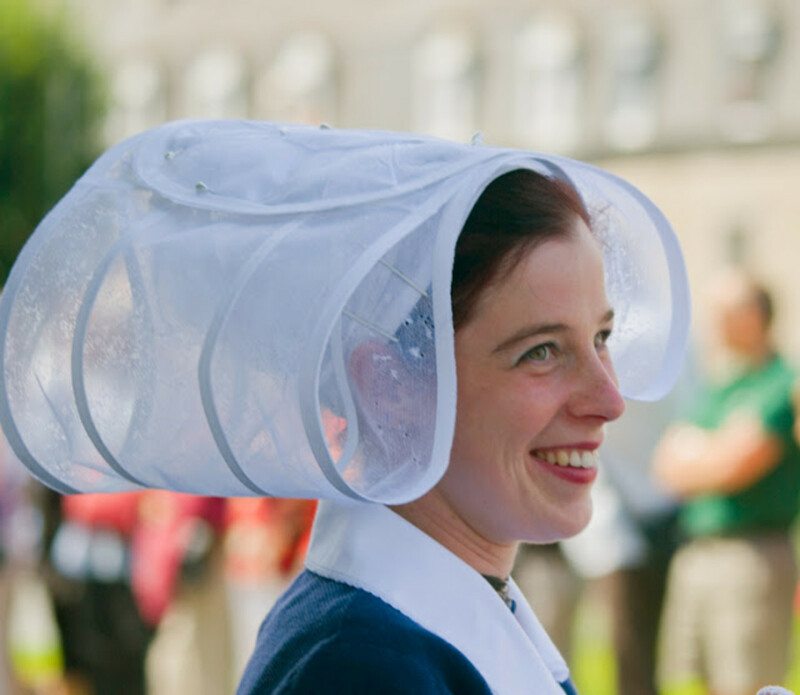 It is an icon of folkloric Brittany. 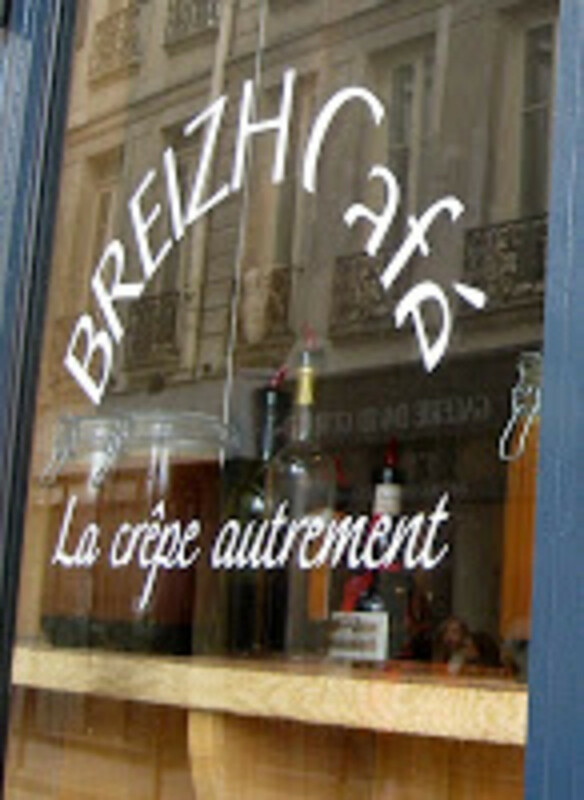 The Breton cuisine is basically French, but has local specialties. The Bretons have their own version of the crepe called a krampouezh-crepe which is a large thin pancake, filled with ham and a sunny-side up egg, and then folded at the corners. It is the only crepe in France that is eaten as a main meal. They also serve their crepes as desserts with a variety of fruits, jellies and jams to fill them. They are exquisite. The Bretons also make a beverage called chouchenn which is a type of Breton mead. Another beverage is chistr, a cider drink. 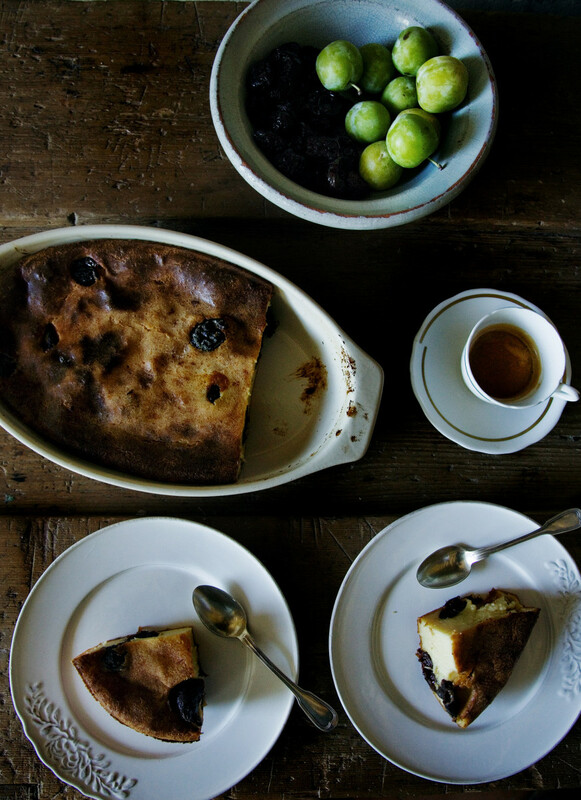 Farsforn is a sweet suet pudding with prunes and Kouign-amann is a meat butter pastry. Lambig is an apple eau de vie. 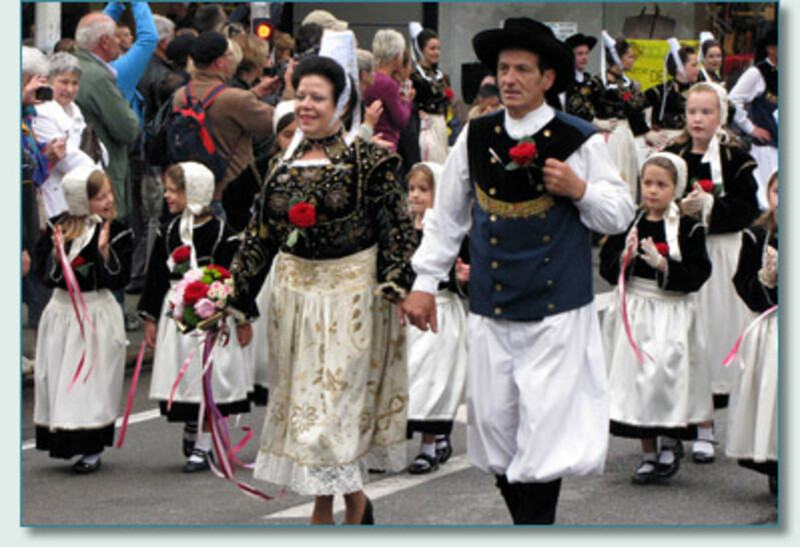 The Bretons are successfully continuing with their culture and customs today. Although, the Breton language is endangered, it is still being taught part-time in the French schools, so hopefully, enough Bretons will keep the language alive and spoken. Breizh: Wonderful to meet a true Breton. I didn't realize that crepes originated in Brittany as that is so interesting. Here in America we always associate crepes with the French, especially Paris. I didn't mean to lump Breton food and French food together. Never having been to Brittany myself, I had to rely on the research I did. I am so sorry to hear that during your parents time Breton was not encouraged in the schools. The victor always makes the rules for others to live by. I hope the Breton language makes a great comeback. Do you speak any Breton yourself? Thank you so much for reading this and I am pleased you enjoyed it! Ysgolhaig: Thank you for reading my article and I am pleased you enjoyed it. Having never been to Brittany, I have to rely on the research I have done. I do say in the article that Gallo and Breton are very close languages and both are spoken in Brittany. I have also provided a map that shows the demarcation line between the two languages. I realized that boundaries are fluid and there can be crossover on both sides. Your name looks Gaelic or Brittonic to me. Are you from Brittany? Gaulish and Brythonic ARE closely related in fact, closer than the Gaelic group of the Celtic family. The two are in the 'Gallo-Brittonic' family are classified so for that reason linguistically. Gaulish and Brythonic are very difficult to separate in most cases and were evolving along similar lines for much of their histories as plentiful evidence reveals. It is the 'Q' group or Gaelic that both Irish, Manx, Scottish and even Celtiberian are part of, that do not fit in well or can be understood. From centuries of constant inter-tribal and intermarriage across the Channel, logically, the Gallo-Brittonic Celtic family is very close to identical. If you need more information, it isn't difficult to find. (Otherwise, this is a very well written article on the Bretons). Hi Ibidii: That is so interesting that your family is from Brittany. I have been to France, but never to Brittany. I would love to see it one day. What a family history you have. I look forward to to hearing about the relative who flew with the Norwegian explorer. I don't believe I know that story so I will find that hub so interesting. Thanks for your visit. And, just a gentle reminder, my name is Suzette, not Suz. Awesome Suz, My husbands grandmother, Henriette 1894 - 1980 was born in Saint Brieuc, Cotes d amp apos, Bretagne, France. Her family is all from that area. She as a teacher in California in the 1940's through the 1960's. 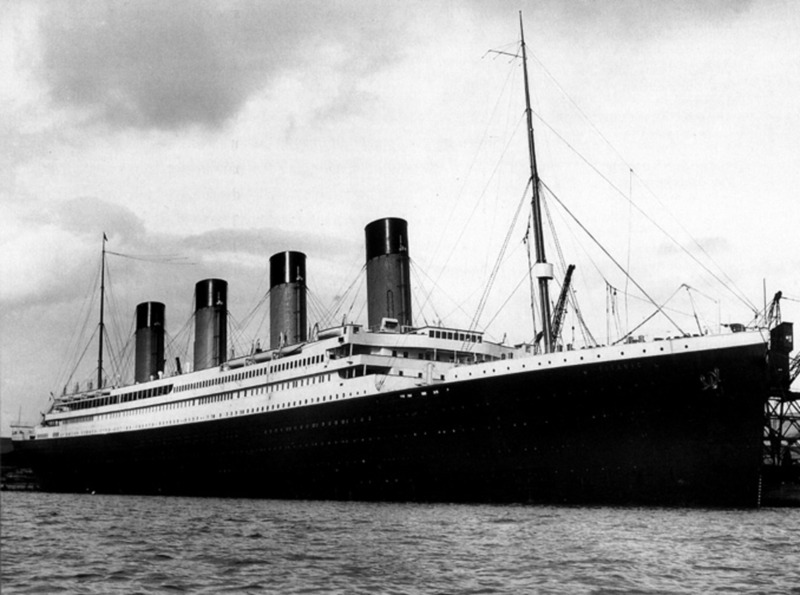 Her brother Albert Madeleine Ludovic Alphonse Cavelier de Cuverville 1892 - 1928 was one who flew with Norwegian explorer Roald Amundsen and co-pilot of the ill fated flight lost off the coast of Norway in 1928. I will be doing a hub on it soon! I will pin this to my Brittany board and reference it when I write the hub! Great information and photos! ologsinquito: Thank you so much for the share. I am so pleased you enjoyed reading this and I agree, Brittany is some place I'd like to see as I have never been their either. Thank you so much for the share and I am so glad you enjoyed this. I know I've commented on this before, but this is an article I enjoyed a lot. If I ever travel again, and go to Europe, I'd love to see Brittany. Dianna: I know, the crepes are to died for! Yes, there are similarities to Breton and Spanish, I think because Galicia and the Basque region originally had Celts living there. As I research this I am seeing more and more patterns and I am intrigued by all these languages. 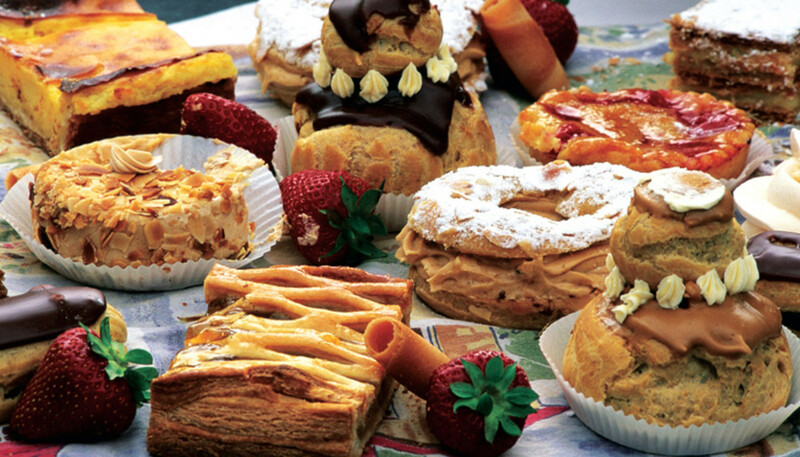 Oh my, the food photos are so tempting! I did see some connection to the Spanish language in some of your word lists. Interesting. Always love to read about other cultures. Thanks. Learning something new daily is my goal and I did exactly that here. 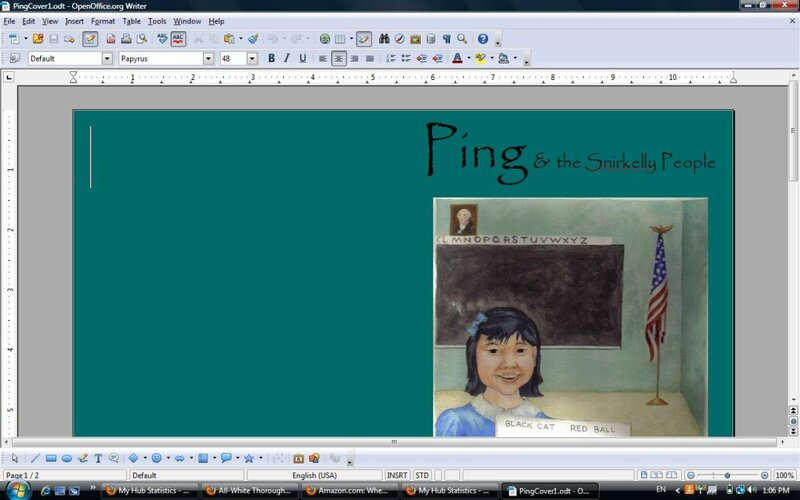 Mike: Well then their teachers are not doing a very good job if students are able to pass off my articles as theirs own. 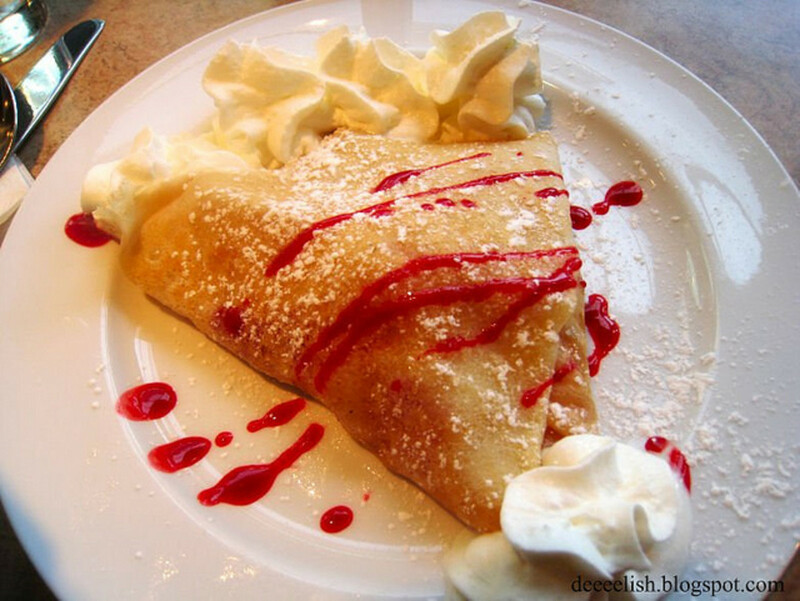 I know, I would seriously travel to Brittany just to eat their crepes. LOL! Thanks so much for the visit and I am glad you enjoyed reading this. Genna: Yes, the French are very francophile. I think that's the right word. They want nothing to do with other cultures and languages except their own French. I have always felt that when in France. I am happy, too that they now are allowing Breton to be taught in their schools. Brittany and its specific Breton culture also has a bit of French in it too. All those Brittany crepes are surely the influence of France as is most of their cuisine. Thank you for reading and I am so pleased you enjoyed this. Imogen: Thank you so much for reading and I am glad you enjoyed reading this. I see you are from southwest England so I can see why this was interesting for you. I am so pleased you enjoyed it. Thanks so much for your visit and comments. Most appreciated. greatstuff: Yes, you are so right. There were many battles fought in Brittany in WWII. 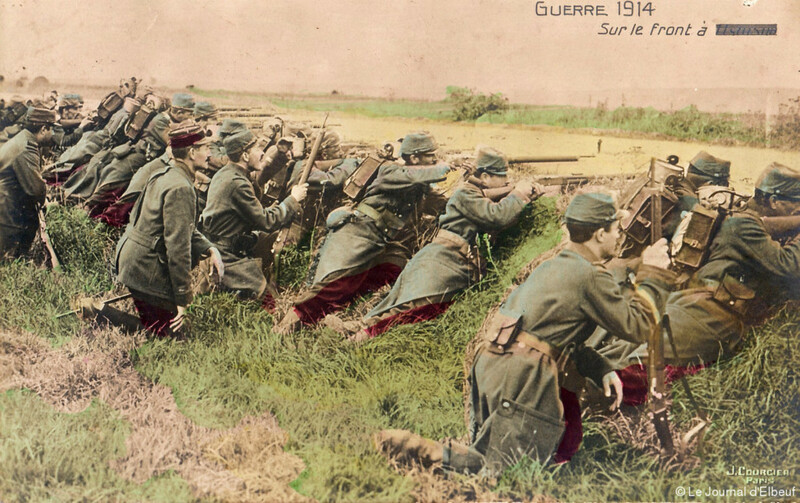 It was quite a battleground and occupied by the Germans for quite some time during the war. I know, I would love to try the crepes from Brittany. They are suppose to have a different taste because they use buckwheat in them and the rest of French crepes do not. The Celts certainly got around and left their mark on the world if you ask me. Thanks so much for your comments.. Most appreciated. Faith: Thank you so much for your comments. Yes, if I was going to learn all about the Celts, so were all of you! LOL! Before I did this series I only connected Celts to the Irish and I never knew they fanned out to so many areas and cultures. It is amazing. My theory now is anyone with western European background has a bit of Celt in them. The Celts basically were all over continental Europe, Great Britain, and Spain specifically. It is interesting that Celts from southwestern Great Britain migrated to Brittany, France. I find this all so fascinating. I guess I should have been an historian. Anyway, thanks so much for your support, Faith and for the votes. Most appreciated. Hi Nell: Yes, the Bretons are definitely connected to the English and Welsh and above all Cornwall. I knew vaguely of the Bretons and Brittany, as I wanted to get there the last time I was in France, but alas, no time. It is an interesting area and would be fun to see and enjoy the Bretons and French crepes at the same time! LOL Thanks so much Nell, as always. This was such an interesting read - I knew there were connections between Cornwall and Brittany, but didn't really know the history behind it, so this was fascinating. Great pictures, and a really thorough overview - thanks for the info. This is all new to me and Brittany always reminds me of WW2, the clashes between the Germans and the Allies. Great story & would love to try those crepes! Excellent hub, Suzette! 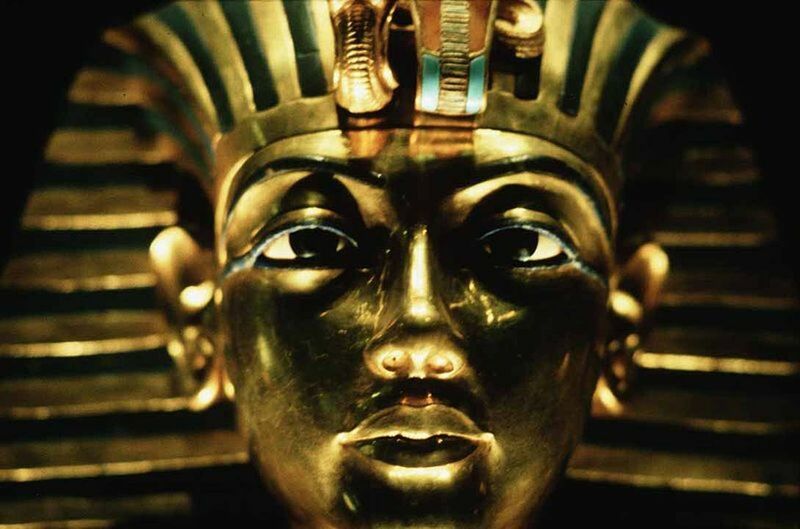 What a fascinating culture and you have written a comprehensive hub here. Who knew ... about all the Celts ... well, thanks to you, we all do. Fabulous Hub Suzette...so informative and so well written. Voting up and sharing! Jools99: Yes, isn't that interesting that Brittany holds on to that British culture and language. Until I wrote this series on the Celts, I only associated Celts with Ireland. Look at what I had been missing! LOL! I love languages and have found the background on all these Celtic languages to be so interesting. It is wonderful that France and Britain have Brittany as a link with one another. Pollyanna: Thank you so much for your comments. Yes, I had heard of the Bretons, but I didn't know the complete story until I wrote this hub. I knew there was a very British part of France, but I didn't now the background of Brittany either. I hope they do not let their language or culture die out. It is an interesting one. Chitrangada: Thank you so much for reading and I am glad you enjoyed this. Yes, anytime I can write about the food I do. I have not been to Brittany, but I have been to France and the crepes are to die for. Actually, I should write a hub about crepes as I have made them myself, but the ones in France are just so special. I'd love to try the one they serve as a main meal in Brittany. Never knew that before either. Thanks so much for stopping by to read. ologsinquito: Thanks so much for reading this and I am glad you enjoyed it. These Celtic groups are so interesting to me and it is so nice of you to take part in my interests. Thanks so much. John: Thank you so much. I appreciate you stopping by to read this and for your votes. Most appreciated. Gosh, Jackie, thank you so much. I enjoyed writing this and I am pleased you enjoyed reading it. Thanks for the votes. You are funny, Bill. I hope it does help those college students, but I will say these Celtic hubs are general in nature. There is much more specifics that these 'college kids' would need to know for class. These may be a good overview for anyone to read, though. I always loved World History and Western Culture when in college and it is my professors in these areas that have inspired me with a love of history. In fact, they were the inspiration for all my travels. I had to see all these places I had learned about in class. I have never been to Brittany, though, and now I am inspired to see it one day. Thanks so much for stopping by to read this and for your comments. Most appreciated. Wonderful hub with many interesting facts and some great photos. Amazing to think that two countries often at loggerheads, France and England have Brittany as an ancient link. Apparently, the British are still welcomed when visiting the region; it's as if Brittany still holds dear that old British connection. Really interesting piece. I had no idea the Bretons headed South from Britain! Learn something new every day. Thank you :-) Voted up. Thanks for telling about the Bretons of Brittany France! Very interesting information and you have presented it so well, giving all the details, even their food. Well researched and well presented! I've heard of this ethnic group, but I didn't know very much about them. Now, I know a lot more. Another awesome article. I agree with both Bill and Jackie. Voted up and away! What a whopper of a hub; terrific! Up and shared.